This is the second of what will be 4 parts comprising the Henry A. Withers lecture I gave at the University of Texas-Houston Department of Family and Community Medicine. When they have all been posted, I will attach them as a "GoogleDoc". A link to a powerpoint presentation of these, developed by Neal Palafox and colleagues at the University of Hawai’i Department of Family Medicine, can be found here, and is definitely worth reviewing. In brief, it pictorially demonstrates that all people are at risk for injury or illness, but some live a little closer to the “edge,” which puts them at greater risk of falling off. The same is obviously true for populations who live “closer to the edge”, who are at higher risk for disease – because of genetic risks, environmental risks, and behavioral risks – but also because they have less money, or social support, or greater stress in their lives. Things that, at the best of times, mean they are just able to get by and keep from falling off. 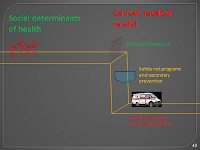 · We can pick up the person, or people, who “fall off the cliff”, who get sick. This is known as “tertiary prevention”, because the bad thing has already happened and we are hoping to prevent complications, prevent it from getting worse. This is where we spend almost all of our “healthcare” dollars. · Or maybe we can put up a safety net. You’ve heard of “safety net clinics” and “safety net hospitals”. This can be thought of as a form of secondary prevention – they have already fallen, their high blood pressure or diabetes has become uncontrolled and they are at risk for something really bad, but we intervene. In the nick of time. · Or we could actually put a fence up on the edge of the cliff, preventing people from falling off. This is a kind of “primary prevention”. But there is something else that might even be more effective. We can move these people further from the edge. 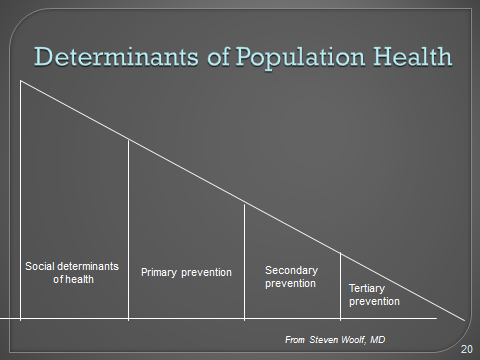 This “pre-primary” prevention actually involves intervening on the core risk factors for health – addressing the social determinants of health. 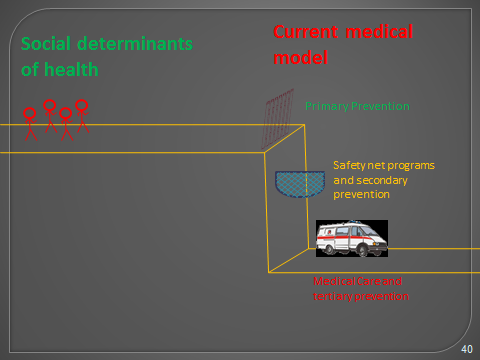 It is not a major component of our current medical model. This is what health disparities are about. They are about differences that we could control. About some people living closer to the edge. And maybe the ambulance doesn’t come as quickly; that is, high tech medical care is less available. Or there is no safety net. And not even a fence, primary prevention. All these three are characteristics of access to medical care. 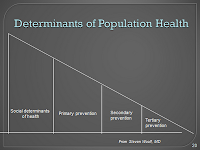 Social determinants address health disparities by asking the questions that Dr. Jones asks: why are there differences in who is found at different parts of the cliff, and why there are differences in resources along the cliff face? Earlier I mentioned the work of John Rawls, and tried to distinguish between the concepts of intrinsic equality (as in the Declaration of Independence, “All men [sic] are created equal”), and people actually being equal in all things (including intelligence, wealth, physical ability, genetics, etc.) I noted Rawls speaks of distributing societal goods equally, which is a different thing. I also noted that the principle of “justice” in medical ethics, which I said implies that people with the same conditions be treated the same. This concept is equity. What is the difference between equality and equity? Which should we strive for? The Declaration of Independence, for example, also states that all men [sic, again] are entitled to “life, liberty and the pursuit of happiness”. It doesn’t guarantee happiness, but suggests some degree of equity, of equality of opportunity. What about when people start, as the folks on the cliff do, from such different places? What are the implications? For example, we have all heard politicians rail against inheritance taxes as “death taxes”, but what does it say about someone who is raised with all the advantages of money – good food, education, support, tutoring – but still cannot compete with a person raised with nothing? Are inheritance taxes good or bad? For myself, I’d say it depends on what we are going to spend the money on. Bombs? Feeding people? Bailing out banks? Housing people? Tudor Hart J, “The inverse care law”, Lancet. 1971 Feb 27;1(7696):405-12.